Google I/O 2014 will be held between June 25 and June 26, and we’re expecting lots of new things to be showcased, or announced then. One of the novelties could be Google Fit - which, according to Forbes, is Google’s very own health-focused mobile service, seemingly rivaling Apple’s Health hub that’s included in iOS 8. It’s said that Google Fit is going to gather health data from wearable devices using open APIs. Forbes reports that Google will announce partnerships with wearable makers (hello, Samsung Gear Fit) at I/O in this regard. The new service should enable Google to create an ecosystem that keeps track of your fitness, and health in general. 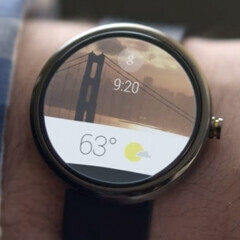 It’s likely that Google Fit will be integrated into Android Wear (seen above), Google’s platform tailored for smartwatches and smart wearables. Of course, we should also expect the new service to work with Android for smartphones and tablets - possibly being offered as a standalone app. Obviously, Google hasn’t confirmed the existence of its Fit service yet. But we do know that wearables will be an important part of this year’s I/O conference, so Google Fit would certainly, uhm, fit there. yes all android wear product support. and man that 360 is so sleek!